The great majority of PCT thru-hikers are from 20 to 40 years old, so most of the forum discussions are aimed at recommendations from and for hikers in this age range. Hiking 2,000 miles on the PCT in 2017 and thru-hiking the PCT in 2018 at 62, and talking with other hikers, I found that some of the advice we had read before getting on trail missed the mark a bit due to age-related differences. I know that some hikers at 70 are stronger than some other hikers at 25, but most of us lose some faculties as we age, and this post is really about adjusting to that reality. What is motivating you to get out on trail? Is it to see the trail, to enjoy being in nature, to get away from the pressures of your ordinary life? Is there something special to you about "achieving" a thru-hike vs. doing a longer section hike? I met one over-60 thru-hiker in 2017 who had hiked 2,575 miles in 2016, but described her 2016 hike as a failure, because she missed a thru-hike by 70 miles. She had announced to her friends and colleagues that she was absolutely going to thru-hike the trail and was mortified that she couldn't achieve her goal. Suggestion: with all the uncertainties of weather, fire closures, and personal injuries, consider your goals and what you announce to friends and family. There is nothing wrong with section hiking till you complete the trail, or even leaving out sections of the trail entirely (gasp!). The hike takes on the meaning you give it. It's hard to make sense of the widely divergent views on the "ideal" start date. Of course, the ideal date is dependent on snow levels, and until the snow pack is fully in place toward the middle of April, no one really knows when it will be feasible to enter the Sierras safely, so you will have to pick your start date far in advance of this information. If you have a start date in early April, you can always take a week or two off after the desert section, but if you start in early May and possibly have an injury that requires a rest period, you could end up "schedule challenged." A lot depends on how fast a hiker you turn out to be. Suggestion: If you won't be fully conditioned when you start, or think you might be a slower hiker, go for a start date during the first two weeks of April. That way you have adequate time to condition on trail and take rest days. It's much more pleasant to finish in Manning Park during early September than after the weather has already turned cold and wet. As you think about your plan, how important is a "straight thru" hike vs. skipping sections and returning to them, or doing part of the hike northbound and part southbound? If it's compatible with your goals, you can hike the trail sections in any order, modifying the order to improve the safety and weather conditions of your hike, and extend the hiking season. For example, going northbound up into the Sierras early can result in more dangerous water crossings, while instead you could be hiking south from Ashland or Dunsmuir in late May and beat the heat in Northern California while you let the snow melt and water levels fall in the Sierras. 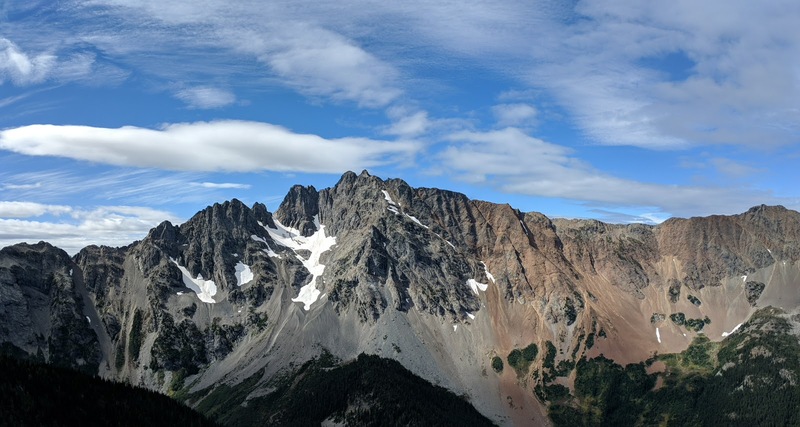 Likewise, you could finish hiking Washington in August before the rain and snow shows up, and leave parts of Oregon for September or even October, missing the mosquito season as well. Suggestion: be open to skips and flips, especially if you are under 5'5", have joint issues, or find that you are a slower hiker. You might have read something like: "it takes about three weeks to get your trail legs." This is both true and ridiculous. You will notice a difference after about three weeks on trail, but you won't really reach a high level of conditioning that quickly. It took me about 1,000 miles to really feel conditioned. When I asked other older hikers what they would recommend for older hikers, every person mentioned conditioning as the number one area to focus on. Suggestion: invest as much time as you can on your conditioning before getting on trail. It will pay dividends in speed, enjoyment, and reduced injuries. If you are comfortable hiking 12 miles with your loaded pack on, with 2,000 feet of climbing, you are likely well enough conditioned to start the trail. Of course you can fall or twist an ankle, but the most common injuries, by far, are over-use injuries. Shin splints and joint inflammation are common, and can cause intense pain as well as take you off trail. Over-use injuries seem to pop up most commonly after the first 300 miles of hiking, so it can be hard to predict these from your conditioning hikes. Ibuprofen, sometimes referred to humorously as Vitamin I, can help a lot, but over-use can lead to kidney damage, so it's not a silver bullet. Rest, is the most reliable cure for an over-use injury, and it's often necessary for older hikers to take 7 days or more off trail to recover from an over-use injury. Suggestion: leave enough time in your schedule that a two-week hiatus to recover from an injury won't prevent you from achieving your hiking goals. Since injuries most often occur in the desert section for NOBO thru hikers, this could just mean getting on trail by the third week in April. The equipment that you need doesn't vary that much from younger hikers, with a few areas to pay special attention to. I was happy to have warm clothes, even when some hikers were shivering to save weight. I have a really good headlamp (Fenix HL12R), because I'm a relatively slow hiker and tend to break camp before it gets light so that I have a longer day--anything that puts out 70 lumens plus is fine. I needed corrective lenses in my sunglasses, so I had some great glasses made by Opticus, a company that specializes in glasses for outdoor activities. And, with family responsibilities it was important for me to have a Garmin InReach and text with my wife every night. Suggestion: lighter IS better, but also take seriously staying warm and other areas that might be important to you. It can be hard and expensive to make a lot of changes once you are on trail, so at least have your base weight under 20 pounds before setting off on your PCT hike. Good nutrition is important, and you will often have a better chance of getting food that you consider nutritionally sound if you mail yourself resupply boxes vs. trying to resupply locally. Brenda Braaten's article "Pack Light, Eat Right" is worth reading. There are a lot of resources to help with resupply planning, so I'll just leave you with that thought on resupply boxes. You will meet hikers of all ages on the trail, and I found myself chatting and enjoying breaks with hikers from 18 to 80. My age never seemed to limit me socially, and that was one of the nicer aspects of being on trail. If you have additional thoughts about tackling the trail after 55, please share them in the comments section. Also, if you are interested in my 2017 and 2018 hikes, I've written blog posts for both years. As an older hiker (60) I agree with the suggestions. I think it is important to stress that to do big miles you should anticipate hiking longer not faster. Faster--like the 20 somethings--will more likely lead to injury. As noted above, get started early in the day as it provides far more options. There is time to stop and rest as needed; to walk slower; and may allow you to stretch a day to get to a water source or better camping alternatives. Also adjust your goals. If your perception is that nothing short of reaching Canada in a season will make your hike a success, there will be constant pressure to cover miles and short-change rest days. I spoke with several older hikers during my section hike this year, one who had completed a thru hike several years ago and was sectioning this year. He said he was enjoying his section hike far more than the thru hike because he did not feel the time constraints of the latter. There is nothing wrong with completing the PCT over multiple seasons--in fact it is similar to savoring a good meal.